For once, this month’s post is, literally, a song of the week, one I discovered on Sunday. It’s become such an earworm since then that I felt bound to investigate it. 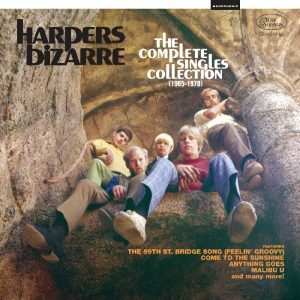 Thanks to a review on excellent The Second Disc reissue review site, I decided to check out the complete singles and B sides of Harpers Bizarre, a US ’60s group who still get played a fair bit and recorded plenty of interesting songs. I’ve grudgingly enjoyed their stuff, much of which seemed to veer rather too close to easy listening, until recently a rather despised genre. The best example of this is their hit version of Feelin’ Groovy which, I now find, features instrumentation from the legendary LA Wrecking Crew. I played through the 26 tracks in three goes, discovering some pleasures, some forgettable versions of show tunes (‘Anything Goes’ anyone?) and the like. The last few numbers, naturally, were from the group’s decline, and of less interest, but then I heard this song. And, straight away, I had to hear it again. Then I had to find out where it came from. 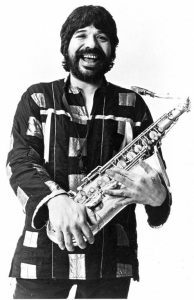 Witchi Tai To was written by Jim Pepper, a Kaw-Muscogee Native American saxophonist who played in early jazz-fusion groups and later with greats like Paul Motian before dying, aged 50, in 1992. Between 1965 and 1968 he was in a band with guitarist Larry Coryell, Free Spirits, that combined free jazz with Native American music. After Coryell left, the remaining band, briefly, became Everything is Everything. They released one album and one single, Witchi Tai To, an early FM hit, which got to number 69 on the charts in the USA. It’s a haunting song, that – according to one story I found online, is based on a chant handed down to Pepper by his grandfather. If anyone can tell me the meaning of the title, I’ll update this post. You can hear the Everything is Everything version here. There’s also a 1983 version by Jim Pepper, which is well worth a listen, as it brings in much more of the jazz and Native American elements that one can feel lurking in the original. The most well known version is by a duo called Brewer and Shipley, who are still around. For me, their rendering (also from 1969) loses something essential, while the Harpers Bizarre single has a mysterious, psychedelic element that lifts it into greatness. But it wasn’t a hit for them and, in 1970, after two years without bothering the charts, they disbanded. Their last album, which this is on, was the first where they played their own instruments. But they had some help. The delicious guitar solo, such an essential part of this but not the other versions, appears to be by a brilliant, young Ry Cooder. Figures. Update: my old pal Mike Atkinson has a UK single of this, also from 1969, which he informs me was the first single ever released on the Charisma label. It’s by the daftly named Topo D. Bil and features Legs Larry Smith, Roger Ruskin Spear, Chris Squire and Keith Moon among others, and it’s not bad. Not a hit, of course. Listen Legs Larry Smith, Roger Ruskin Spear, Chris Squire and Keith Moon among others. Have a listen. There’s also a version by John Schroder, which is on Spotify, that I was alerted to by Andy Lewis on Twitter. It’s OK, but still misses the sweetness and mystery of the Harpers Bizarre version. This entry was posted on Wednesday, January 25th, 2017 at 12:03 pm	and is filed under Song of the Week. You can follow any responses to this entry through the RSS 2.0 feed. You can leave a response, or trackback from your own site.